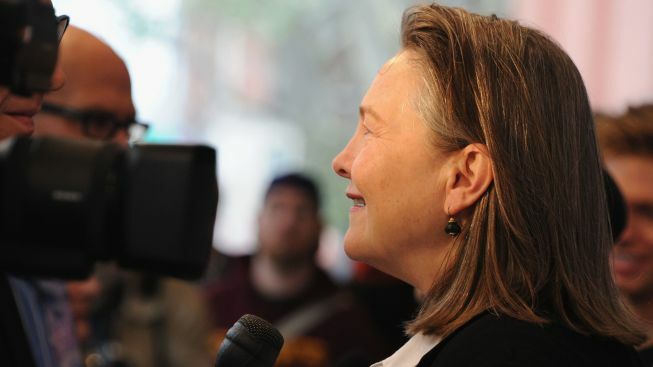 Cherry Jones, pictured during a talk at the 2013 Tribeca Film Festival, faced a hostile U.S. Congress as head of a government-run arts program in Tim Robbins' movie "Cradle Will Rock." The musical that inspired that 1999 film inaugurates City Center's "Encores! Off-Center" series July 10-13. Broadway leading lady Cherry Jones doesn’t appear in City Center’s new staging of “The Cradle Will Rock,” the rarely seen Depression-era musical set against the backdrop of a steelworkers’ strike, but she’s doing everything she can to support it. Back in 1937, the pro-union show went on in defiance of the federal government’s Works Progress Administration. The opening night heroics of composer Marc Blitzstein, “Cradle” producer John Houseman and director Orson Welles -- and, most of all, the actors -- kept the production alive and marked a legendary moment in theater. That’s where Jones comes in today. Alongside actress Lisa Kron (“Well”), the two-time Tony winner (“The Heiress,” “Doubt”) will narrate “The Legend of ‘The Cradle Will Rock’” as a pre-show lobby event on July 13, relating a segment of American cultural history that deserves one more airing, especially in an era of ongoing corporate excess. City Center’s “Cradle” runs July 10-13, and counts among its stars Raul Esparza, Anika Noni Rose, Judy Kuhn and Danny Burstein. It’s the inaugural performance in the “Encores! Off-Center” series. Jones, needless to say, isn’t entirely unfamiliar with Blitzstein’s musical: she co-starred with Bill Murray, Vanessa Redgrave, Jack Black and oodles of other familiar faces in Tim Robbins’ 1999 film called “Cradle Will Rock,” a comedy-drama focusing on the backstory of the tuner’s opening night. Meanwhile, the story of “Cradle” and the-opening-that-almost-wasn’t, as told on video by Houseman himself, can be found at the bottom of this page. NBC4NY: “The Cradle Will Rock” isn’t revisited very often. You told me you’ve never been able to see a production, and you starred in a movie about how it was made! Why do you think it gets so little time in the limelight? JONES: Well, I always knew about it, but not until I worked on Tim Robbins’ film did I really understand the power of that (opening) evening. ... It’s difficult. It’s everything that still makes Americans squirm, because there are so many different opinions on the matters of unions and greedy capitalism and the workers’ plight ... but it’s certainly a musical that should be done on a regular basis, considering where we continue to be as a nation. NBC4NY: That first opening night almost didn’t happen, because the WPA actually forbade Welles, Houseman and the actors from using the theater where they’d been working. JONES: I don’t know if you know this, but apparently at about 7:30 or 8 p.m. that night, (Welles and Houseman) still didn’t have another theater. And finally, a little man in a felt hat appears -- this is what it says in Houseman’s memoirs -- and he says he’s found another theater, but he needs $100 to get the owner to hand over the key. And as Houseman wrote, the (cast and crew) didn’t have 5 cents between them. But there was a group of journalists who had been in there with them all day long, interviewing Houseman and Welles in the ladies room of the theater where they were meant to perform -- because the WPA security guards had taken over every other area of the theater except the ladies’ powder room! -- and anyway, when Welles and Houseman realized they needed $100, they actually got it from the journalists. NBC4NY: Wow. I don’t foresee history ever repeating itself. JONES: Mmmmm ... I guess it’ll depend on the cause. NBC4NY: It’s tough to imagine a universe where the federal government chose to put people to work by creating a large-scale theater program such as the WPA's Federal Theatre Project ... never mind that the politicians who created it ultimately let it die because of the so-called “left-leaning” nature of the projects that were coming out of it. NBC4NY: So as the story goes, there was this actress Olive Stanton, who was playing Moll, the prostitute that Anika Noni Rose is playing in City Center’s new production. And Olive, who had been ordered not to perform “on stage” by her union, actually stood up and started to sing from the audience while Blitzstein was up on stage, all alone with his piano. It was this momentous act of courage, and many of the other actors soon followed, and of course this all really happened ... and at the risk of putting you on the spot, I’m wondering what you might have done in the same situation? JONES: It makes me cry just thinking about it. ... I like to think that whether I would have been that one little girl standing up or not, I sure as hell would’ve stood up right alongside her. The WPA was an amazing project. It put millions to work at what they actually did for a living. I think they were making $28 a week or something, but that was manna from heaven. It was such a brilliant project, and we have all those gorgeous murals still today to thank them for. NBC4NY: A musical about underpaid workers and corporate greed ... these themes ... well, you know what I’m going to say. JONES: In this country, almost anytime is good to be doing this play. ... We’ve supposedly survived this last recession, but I don’t think any of us really believe we’re out of the woods for any sustained period of time, and a “Cradle Will Rock” presentation is a very powerful reminder of what happens when corporate interest is the primary focus of the major corporations, and not the workers. You’ve got to give people a living wage so they can buy the things that those corporations make. ... It just seems like the only way we’re going to recover is to bring back manufacturing, giving skilled workers something to do and paying them. But I’m an idealist, not an economist. NBC4NY: In the Robbins film, you played Hallie Flanagan, the upbeat head of the Federal Theatre Project, which at first was lending financial support to “Cradle,” before things got ugly with HUAC. What’s a memory you have of working on the film? JONES: My clearest memory is of what a driven, delightful task-master Tim Robbins was. You know, Hallie Flanagan only got a few hours to testify before HUAC, answering all of the slanderous claims against her that people had been testifying about for the three previous months. Her testimony was brilliant, but everything she said was just washing over HUAC like a wave. Tim had chosen different passages from her testimony, and they were difficult to learn, because she was so intelligent. So I remember on one lunch break, Tim came in with this 30-line speech that he wanted to add, and he said: “Could you learn this, and we’ll film it this afternoon?” And I just remember thinking: “You S.O.B. You’re an actor, and you’re asking me to learn this impossible speech right now? I couldn’t have a cheat-sheet, or the camera would’ve seen me reading it. ... So I did, somehow, manage to learn the speech ... and of course, it never made it into the film. But it was a white-knuckle ride, and I enjoyed the challenge immensely. NBC4NY: You’re a veteran in this industry, and I’m wondering if you’ve seen anything during your career that approaches what Olive and her cast-mates did, in terms of defiance? JONES: The first thing that comes to mind, and maybe the only thing, are the numbers of theaters around the country that started producing, very boldly, the series of AIDS plays that came out in the mid-‘80s. Obviously, it wasn’t particularly brave for The Public to produce “The Normal Heart,” or even Circle Rep to produce “The Baltimore Waltz.” But those theaters out in the hinterlands -- and I can use that word, because I’m from Tennessee --- those theaters that produced “Angels in America,” those are the theaters and communities that are to be commended, because those plays were a huge risk in Bible Belt areas. I remember talking to a young man, whose high school or college deep in the heart of Texas produced “Angels.” It was 10 years ago, but even that is a little act of courage, and then for the actors to walk around in the community having played AIDS-riddled gay men? ... On another note, I spoke to a ninth-grade class in my hometown, about 300 kids, and at the end of the talk, a bunch of kids came down, probably 10 of them, who are openly gay in ninth grade, in my hometown, of Paris, Tennessee, and I asked them what’s made the greatest difference to them, in terms of being able to feel comfortable, and they all said one word: “Glee.” And that’s incredible. We are powerful. Artists are powerful. JONES: That’s the last thing I think about. In fact, I don’t think about that at all. We go in with our cast and our director and designer, and we just try to send it flying the best way we can. I will say, I think there’s a real confederacy of women who’ve gotten to play that role. Because I didn’t even really want to do it, and (director) John Tiffany talked me into doing a reading of it, and I realized I had to. But along the way, so many women who played it -- there are hundreds floating around, some of them dear friends -- have all said: “Oh, isn’t it the most marvelous role?” So that’s a fun thing, when you share roles with other actresses, and I take comfort and courage from my band of sisters ... Julie Harris, Jessica Lange, Sally Field, and on and on. NBC4NY: A lot of us are excited “24” will be returning, and you played President Allison Taylor on its final two seasons. As with most presidents on “24,” things didn’t end well for you -- you surrendered to the Attorney General because of your role in a cover-up that almost led to Jack’s death. Is there a chance we’ll see you again? JONES: Oh, I think I may be in the workhouse. Or under house arrest on some ranch in Colorado. NBC4NY: Deservedly so, but on “24” that wouldn’t necessarily write you out of the series.